Interested in hiring a genuine VW Campervan? Wye Campers based in Clyro, Herefordshire specialise in Volkswagen camper van hire. They can provide fully restored models suitable for camping equipped with 2 burner stoves, cool boxes and a gas heater to keep you warm. 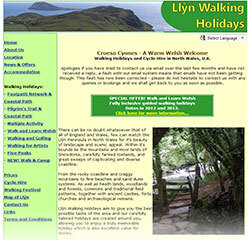 We’ve partnered up with the Llyn Walking Holidays website that is full of information and suggestions for walks in across the Llyn Peninsula and beyond.